Photoshop is an image-editing program. An image with complex edges can be extracted and used in other images. A logo is a distinctive shape used to represent an organization. Photoshop images are generally small in size. In Photoshop, the text you create and edit in a special text layer is called type. The Save As command creates two duplicates of the original file. All tools are always displayed on the Toolbox. Each Photoshop tool has a corresponding shortcut key. You can use the Layers palette to control which layers are visible in an image. The position of a layer in the Layers panel can be changed. A digital camera is a device that can be used to create electronic images. 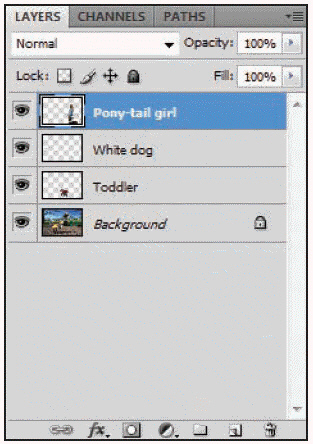 Use the Image menu to close a file. The figure above represents an image that consists of three layers. You might significantly enhance your computer's performance by hiding or resizing the Layer panel thumbnail images. The order of layers does not affect the appearance of a Photoshop image. You can change the order of layers in the stack. A background layer cannot be modified as extensively as an image layer. You cannot alter a Background layer's color or opacity but it can be deleted or converted into another kind of layer. A background layer cannot be changed into an image layer. Only adjacent visible layers can be merged. When you drag a selection to a destination image, Photoshop places the selection on the previously active layer. A layer group allows you to organize layers on the Layers panel. Changes made to the blending mode or opacity changes don't affect every layer in the layer group. Only one layer exists in a flattened file. You can create a flattened image using the Save a Copy dialog box. You can expand the layer group by clicking Item 4 in the figure above. Item 5 in the figure above indicates the active layer. You can create a new layer by clicking item 7 in the figure above. A selection stays selected until you use the Deselect command. Small dashed lines, called Perimeters, surround a selection. All marquee fastening points are visible. An entire image can be selected by a command found on the Image menu. You can use the Rectangular Marquee Tool to create a square. Press Tab while dragging the Rectangular Marquee Tool to create a square. You can insert additional fastening points by clicking the pointer while dragging. The Width setting determines the area in which the Magnetic Lasso Tool detects an edge from the pointer. The Edge Contrast setting determines the Magnetic Lasso Tool's sensitivity. You can make a selection surrounded by a marquee grow by clicking the pointer while dragging. There are selection buttons on the options bar that are used to create or modify a selection. Low contrast between colors is an ideal condition for making selections based on color. The Healing Brush Tool can be used to fix imperfections in an image. A vignette is a picture or portrait whose border fades into the surrounding color. You can create a vignette using a marquee or lasso tool. If a color is out of gamut for a color model, it will still be seen accurately on the monitor screen but it won't be printed with precision. Subtractive colors are used for lighting, video, and computer monitors. The background color is used to make gradient fills and fill in selected image areas. It is possible to delete a color from the Swatches panel. The Sharpen More filter increases the contrast of adjacent pixels. When you convert a color image to grayscale, the light and dark values --called luminosity-- are deleted when the color information is deleted. The Focus filter lets you sharpen blurry images. You can see a list of blending modes by clicking the Add a layer style button on the Layers panel. Item 3 in the figure above lets you add a color to the Swatches panel. Item 1 in the figure above lets you reset the foreground and background colors to their default settings. Color and imagery are often used to reinforce the text message of an image. Special effects can be applied to type to make it stand out, or appear to pop off the page. Outline type will develop jagged edges if resized. Bitmap type is composed of pixels. You cannot use the Swatches panel to change type color. The Color panel can be used to change the color of type. Kerning controls the amount of space between lines. Kerning controls the amount of space between characters. Kerning, tracking, and leading all have the same meaning. Leading controls the amount of space between characters. Leading controls the amount of space between lines. The Check Spelling command is available as a selection on the Character panel. 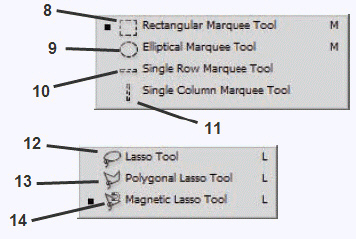 The Horizontal Type Tool is located in the Tools panel. The Edit menu can be used to add a drop shadow. By looking at the Layers panel, you can tell if a type layer contains effects. As a rule of thumb, anti-aliasing is applied to sans serifs fonts greater than 8 points in size. The current state is listed in the Navigation panel. 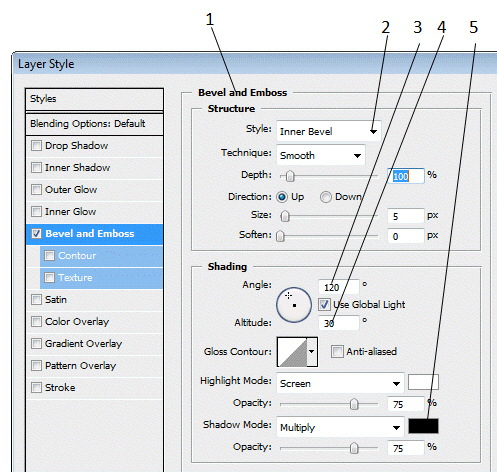 The Layer menu or the Layers panel can be used to add the Bevel and Emboss effect. A blur value that is set too low can make text unreadable or cause it to disappear entirely. A blur value that is set too high can make text unreadable. Use the Layer menu to apply a filter. Items 3, 4, and 5 in the figure above are used to modify the shading of the Beveled and Embossed type. Items 3, 4, and 5 in the figure above are used to modify the structure of the Beveled and Embossed type. Photoshop is a powerful tool for _____. An irreversible process used to reduce the size of Photoshop files is called ____. What tool can you use to outline sections of an image? What program lets you optimize, preview, and animate images? You can use the ____ feature to find an existing file. Which area of the Photoshop window contains frequently used tools? Where are all layers within an open image displayed? A Photoshop image must contain ____. Which dialog box is used to select print options? The direction in which an image appears on the page is called ____. Which dialog box is used to determine how many copies of an image are printed? Which menu is used to close a file? Katie plans to use Photoshop to help her create striking images for her Web page. Which of the following Design Suite programs is web production software? Otto has been working on a special image he wants to include on a birthday card for his mother. He applied several effects to a photo of his family, and he added text to the image. He worked for hours to get the image just right, and he’s just about ready to print the card. If Otto wanted to see a list of the changes he made in the image, where would he look? 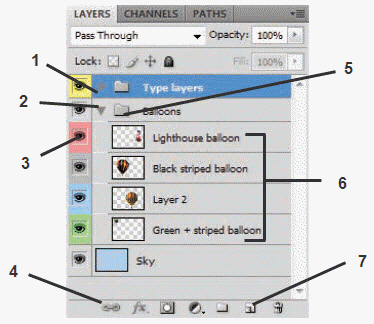 The Layers panel includes the following different kinds of layers except _____. What component of the Layers panel can show a miniature image of a layer's contents? You can change the location of the Layers panel on the screen by ____. What is used to turn off the thumbnail display? What layer is always at the bottom of a stack? Which of the following pairs are not a unit of measurement for rulers? What menu command allows you to change your units of measurements preference? What determines the percentage of transparency in a layer? Which of the following can be used to create a layer? Hiding portions of an image without losing resolution quality is called ____. An area in an image that is surrounded by a marquee is called a(n) ____. Which selection tool lets you isolate complex shapes? Where is the Move Tool located? When an image is flattened, all visible layers are combined in the ____. Which menu is used to flatten an image? A file's size can be significantly reduced using the ____ process. Dex teaches Zelda that there are several ways to create layers. Which of the following is NOT one of those ways. Zelda was already familiar with Photoshop’s selection tools, so when Dex quizzed her, she was not easily fooled. In the following, which is the only tool that actually exists? How many basic methods of selection are there? Which setting blurs the area between the selection and the surrounding pixels? To slightly enlarge a marquee you can use the ____ command on the Select menu. Using an arrow key to move a selection is called ____. When the Magic Wand Tool is selected the ____ on the options bar lets you select pixels that are next to one another. When the Magic Wand Tool is selected, the options bar does not include a(n) _____. Which tool/command lets you fix imperfections in an image? Which tool/command lets you exclude contiguous pixels? Which of the following settings should create a nice fade in a vignette? For which of the following reasons might Adam use the Healing Brush Tool? Each dot in a bitmap image is called a(n) ____. Which color model, based on one luminance component and two chromatic components, has the widest range of colors? RGB colors are _____, which means they create white when they are all combined with the values set at 255. Which color model is used by commercial printers to create color separations? In Photoshop, the _____ color is used to make gradient fills and fill in image areas that have been erased. The process of adding a border to a selection is called ____. Which of the following is not the name of a gradient tool? The Gradient Editor allows you to make all the following modification except? Where are the Linear Gradient options located? How many shades of gray are available in a grayscale image? Which of the following is not a consideration when choosing blending modes? Which slider in the Color Balance dialog box can give a redder appearance? Which item in the figure above fills the background with the active color? Mr. Pica wants to be sure there is a border around the photo. What is the process of placing that border called? Which statement is true about outline type? Font families are generally divided into each of the following categories except _____. Which category of font is generally used in long passages of text because it is easier to read? To which font family does Times New Roman belong? ____ sets a uniform amount of space between selected characters. _____ is used to control the amount of space between characters and is a form of proportional spacing. The distance that type appears from its original vertical position is called ____. In which area of the Photoshop screen is the Horizontal Type Tool located? An identical layer of text behind selected type is called a _____. Which menu can be used to add a drop shadow? What is the default drop shadow color? Generally, using more than ____ font(s) in one image is ill-advised since it might be distracting to your readers. The Bevel and Emboss style is used to add combinations of _____ and _____ to a layer. Which menu can be used to add the Bevel and Emboss effect to type? Which of the following can be controlled in the Bevel and Emboss effect? Most filter dialog boxes have zoom in and zoom out buttons that make it easy to see the _____ of a filter. A Gaussian blur is an example of a(n) ____. You want your type to be displayed with the best possible resolution, so which anti-aliasing method should you use? To add interest, you decide to apply the Colored Pencil filter to the names. Before applying the filter, you must _______________ the type. You decide not to use a filter, but when you try to edit the type you are unable to change it without causing huge problems in the layer. Why? Photoshop is a(n) ____________________ program. ____________________ is a companion Web production program that lets you compress / optimize image quality and animate images. In Photoshop, text is referred to as ____________________. A(n) ____________________ is a graphic with a distinctive shape used by an organization. A(n) ____________________ file has all layers irreversibly combined to reduce file size. ____________________ is fully integrated with Photoshop. In Windows, open Photoshop using the ____________________ button. Create a new file from scratch using the _______________ dialog box to set the Height and Width dimensions. Rulers can be displayed by clicking Rulers on the ____________________ menu. The order in which the layers appear in the ____________________ Panel matches the order in which they appear in the image. Only ____________________ layer(s) can be active at a time. When a layer is ____________________, you are not able to merge it with another layer, select it, or print it. The Index panel tab in Photoshop help shows topics arranged ____________________. You can use the ____________________ menu to open Bridge. You can turn off the thumbnail display using the list arrow in the ____________________ panel. A(n) ____________________ layer cannot be modified as extensively as an image layer. You can change a ruler’s units of measurement by pointing to Preferences on the Edit (Win) or Photoshop (Mac) menu and selecting ____________________ & Rulers. The ____________________ menu is used to turn an image layer into a Background layer. The Create a new layer button is located on the ____________________ panel. Photoshop always numbers layers ____________________ no matter how many you add or delete. You can restore a deleted layer during the current editing session by deleting the ____________________ state on the History panel. Hiding portions of an image without losing resolution quality is called ____________________. The ____________________ Lasso lets you isolate complex shapes. When you use the Move Tool to drag a selection to the destination image, Photoshop places the selection in a(n) ____________________ layer. A(n) ____________________ group lets you organize layers, and is similar to a folder on your hard drive. ____________________ a layer is a good way to preserve modifications to a layer because you don't have to worry about losing your original work. A file's size can be significantly reduced using the ____________________ process. You can use the ____________________ menu to flatten an image. When an image is flattened, all visible layers are combined in the ____________________ layer. Item 5 points to the ____________________ group icon. ____________________ is the technique used to combine elements from different images. There are ____________________ free-form tools you can use to create your own unique selections. A(n) ____________________ is an anchor within the marquee. A selection stays selected until you ____________________ it. Press ____________________ while dragging the Rectangular Marquee Tool to create a square. To select an entire image, click ____________________ on the Application bar, and then click All. You can reselect a deselected object by clicking Select on the Application bar, then clicking __________________. After a selection is ____________________, you can move, copy, transform or make adjustments to it. You can deselect a selected object by clicking Select on the Application bar, then clicking ____________________. You can ____________________ change any selection tool into the Move Tool by pressing and holding [Ctrl] (Win) or [command] (Mac). You can nudge a selection using the ____________________ keys. ____________________ is a setting that lets you specify whether similar pixels will be selected. ____________________ contrast between colors is an ideal condition for making selections based on color. You can use the ______________________ command to make the same selections as with the Magic Wand Tool. The Color Range command does not give you the option of excluding contiguous pixels as does the ______________________ Tool. In Photoshop, you can create a vignette by creating a(n) ____________________. A(n) ____________________ effect uses feathering to fade a marquee shape. The ____________________ of a color model is the range of colors that can be accurately reproduced. ____________________ colors are used for lighting, video, and computer monitors. The ____________________ mode can display up to 256 shades of gray. Photoshop's ____________________ color is used to make gradient fills and fill in erased image areas. Photoshop's ____________________ color is used to paint, fill, and stroke selections. The _________________ panel displays the X (horizontal) and Y (vertical) coordinates of the cursor. A new color can be added to the ____________________ panel by sampling a color from the image. The process of adding a border to a selection is called ____________________ the edges. You cannot lock transparency or image pixels in a(n) ____________________ layer. If you want to change the location of a stroke, you must first ____________________ the previous one since, by default, Photoshop applies the new one over the old. If there is an element of a layer that you wish to protect, such as transparency, you can ____________________ it to prevent changes. Locking options are found on the ____________________ panel. A(n) ____________________ is a blend of colors used to fill a selection of a layer or an entire layer. When you click the ____________________, five gradient style buttons display on the options bar. You can adjust the opacity and color of a gradient by using sliders found in the Gradient ____________________ dialog box. You can use the Gradient ____________________ to create a new gradient from an existing one, modify an existing one, add some intermediate colors to a gradient, or adjust a gradient's opacity. The Gradient picker can be closed by pressing ____________________ in either Macintosh or Windows. A brightness value from 0 (black) to 255 (white) is assigned to each pixel in a(n) ____________________ image. The light and dark values of pixels found on a grayscale or color image is called __________________. A(n) ____________________ gradient effect can be applied to a grayscale image by using a Gradient Map. Hue, Saturation, and ____________________ sliders are found on the Hue/Saturation dialog box. Hue, saturation, brightness, and contrast controls can all be accessed by using the ____________________ command on the Image menu. As you adjust hue and saturation settings, you may create ____________________ in your image. A(n) ____________________ is a complete set of characters, letters, and symbols for a particular typeface. Arial belongs to the ____________________ font family. Each character of a font is measured in ____________________. The Horizontal Type Tool is located in the ____________________. You can use the ____________________ Tool to change the color of type. ____________________ controls the amount of space between characters. ____________________ controls the amount of space between lines. The Layer styles are linked to the contents of the layer, which means that if a layer is moved or modified, the styles will still be ____________________. The ____________________ menu can be used to add a drop shadow. ____________________ is the default drop shadow color. ____________________ is useful for improving the display of large type in print media. The current state is displayed in the ____________________ panel. The ____________________ menu can be used to add the Bevel and Emboss effect. Some of the ____________________ effects you can create include, Glass, Pinch, Ripple, Shear, Spherize, and Twirl. Because you cannot edit type after it has been ____________________, you should save your original type layer by making a copy of it and hiding it from view. The figure above is an example of using a ____________________ to place emphasis on type.